How Is Geometry Used in Architecture? Where Do We See Geometry in Architecture? Some say architecture begins with geometry. Since earliest times, builders relied on imitating natural forms—the circular Stonehenge in Britain—and then applied mathematical principles to standardize and replicate the forms. The Greek mathematician Euclid of Alexandria is considered the first person to write down all the rules related to geometry, and that was way back in 300 B.C. Later, in about 20 B.C. the ancient Roman architect Marcus Vitruvius wrote down some rules about architecture in his famous De Architectura, or Ten Books on Architecture. We can blame Vitruvius for all the geometry in today's built environment—at least he was the first to write down the proportions for how structures should be constructed. It wasn't until centuries later, during the Renaissance, that interest in Vitruvius became popular. Cesare Cesariano (1475-1543) is considered the first architect to translate Vitruvius' work from Latin into Italian in about 1520 A.D. Decades earlier, however, the Italian Renaissance artist and architect Leonardo da Vinci (1452-1519) sketched out the "Vitruvian Man" in his notebook, making da Vinci's the iconic image imprinted onto our consciousness even today. The images of the Vitruvian Man shown here are inspired by the works and writings of Vitruvius, so they are called Vitruvian. The "man" portrayed represents the human being. The circles, squares, and elipses that surround the figures are Vitruvian calculations of man's physical geometry. Vitruvius was the first to write down his observations about the human body—the symmetry of two eyes, two arms, two legs, two breasts must be an inspiration of the gods. The Roman architect Vitruvius believed that builders should always use precise ratios when constructing temples. "For without symmetry and proportion no temple can have a regular plan," Vitruvius wrote. 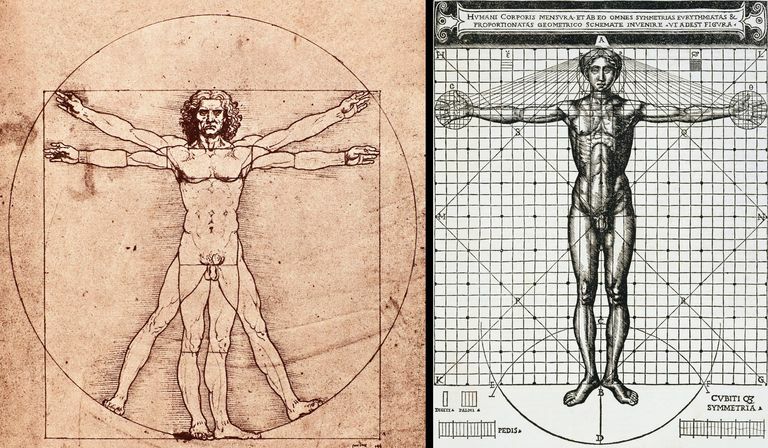 The symmetry and proportion in design that Vitruvius recommended in De Architectura was modeled after the human body. Vitruvius observed that all human beings are shaped according to a ratio that is astonishingly precise and uniform. For example, Vitruvius found that the human face equals one tenth of the total body height. The foot equals one sixth of the total body height. And so on. Scientists and philosophers later discovered that the same ratio Vitruvius saw in the human body—1 to phi (Φ) or 1.618—exists in every part of nature, from swimming fish to swirling planets. Sometimes called a golden ratio or divine ratio, the Vitruvian divine proportion has been called the building block of all life and the hidden code in architecture. Is Our Environment Shaped by Sacred Numbers and Hidden Codes? Does this sound absurd? Before you dismiss the idea of sacred geometry, take a few moments to reflect on the ways some numbers and patterns appear again and again in every part of your life. Patterns themselves may not be geometrically divine, or adhere to a mathematical ratio, but often they instill a sense of harmony in the observer. When studied under the microscope, living cells reveal a highly ordered system of shapes and patterns. From the double helix shape of your DNA to the cornea of your eye, every part of your body follows the same predictable patterns. The jigsaw puzzle of life is made up of recurring shapes and numbers. Leaves, flowers, seeds, and other living things share the same spiral shapes. Pine cones and pineapples, in particular, are composed of mathematical spirals. Honeybees and other insects live structured lives that mimic these patterns. When we create a floral arrangement or walk through a labyrinth, we celebrate nature’s innate forms. Nature’s archetypes are reflected in the crystalline forms of gems and stones. Amazingly, the patterns found in your diamond engagement ring may resemble the formation of snowflakes and the shape of your own cells. The practice of stacking stones is a primitive, spiritual activity. Similar shapes and numbers are found beneath the sea, from the swirl of a nautilus shell to the movement of the tides. Surface waves themselves are patterned, like waves that pulse through air. Waves have mathematical properties all their own. Nature’s patterns are echoed in the movement of planets and stars and the cycles of the moon. Perhaps this is why astrology lies at the heart of so many spiritual beliefs. The vibrations we call sound follow sacred, archetypal patterns. For this reason, you may find that certain sound sequences can stimulate the intellect, inspire creativity, and evoke a deep sense of joy. Stonehenge, megalithic tombs, and other ancient sites stretch across the globe along underground electromagnetic tracks, or ley lines. The energy grid formed by these lines suggest sacred shapes and ratios. Best-selling author Dan Brown has made a lot of money by using the concepts of sacred geometry to weave a spell-binding tale about conspiracy and early Christianity. 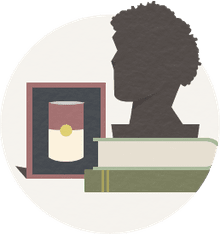 Brown's books are pure fiction and have been hotly criticized. But, even when we dismiss The Da Vinci Code as a tall tale, we can't dismiss the importance of numbers and symbols in religious faith. Concepts of sacred geometry are expressed in the beliefs of Christians, Jews, Hindus, Muslims, and other formal religions. But why didn't he call the books The Vitruvius Code? From the pyramids in Egypt to the new World Trade Center tower in New York City, great architecture uses the same essential building blocks as your body and all living things. In addition, the principles of geometry are not confined to great temples and monuments. Geometry shapes all buildings, no matter how humble. Believers say that when we recognize geometric principles and build upon them, we create dwellings that comfort and inspire. Perhaps this is the idea behind the architect's conscious use of divine proportion, like Le Corbusier did for the United Nations building.